Hello and welcome to Butterfly Reflections Ink! I just love this sleepy little pup! All of the images on this card are from the adorable Christmas Dreams stamp set by Lawn Fawn. I colored the images with my Copics and cut them out with the Christmas Dreams Lawn Cuts die set. 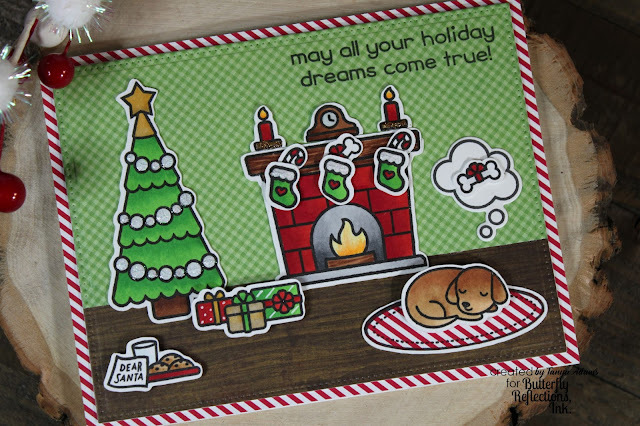 I also used some darling prints from the Here Comes Santa Claus paper pad from Doodlebug Design to create my card background. I hope all of your holiday dreams come true! This is such a great Christmas scene! And I LOVE the dreams above the sweet pups head... Just adorable!